Many people drive their cars every day. They used to be called “traveling salesmen” or “sales reps”, and today they’re “field salesmen” or “customer-facing sales staff”. Or those of us who want to or have to commute to work by car every day because living in the big city is simply no longer affordable. Doing that, it’s easy to rack up 500 or more miles a week. So what are the best cars for eating up the miles? Along with a number of criteria such as economy, easy repairs and comfort, lights are becoming more and more important for many people, especially the ones who are out during the evening or night. If you can see the road clearly ahead of you, you have a more relaxed journey. Not just in new vehicles. 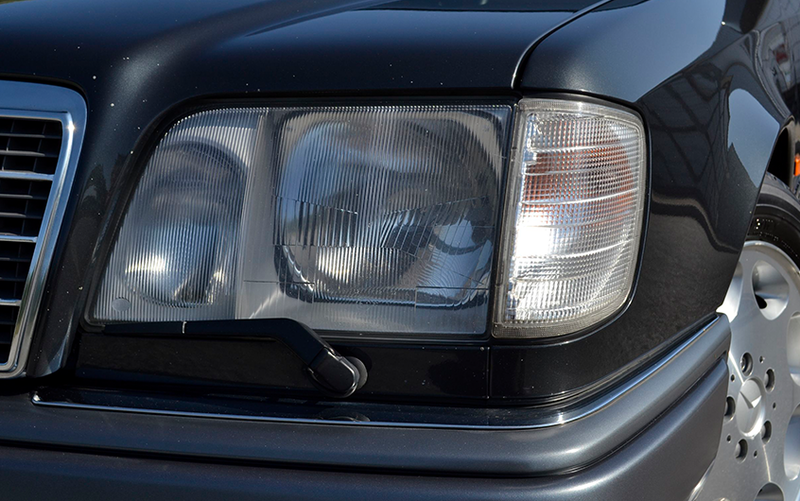 Today we take a look at the factory-fitted lights in an old E-Class, the T model in the 124 series from Mercedes-Benz. You can’t imagine not seeing a 124 on the roads. It was built over 2.3 million times between 1984 and 1997 as a sedan, station wagon, coupé and convertible, and in a German’s mind, not just the older ones among us, it is still THE taxi. From 1993 it was called “E-Class”; and even though the company was known for its epic lists of optional extras, there was one thing that all models had ex works: big H4 headlights and integrated H3 fog lights. No matter whether you felt you needed them or not. And by the time fog was creeping across the valley in the early morning during the cold winter months and made the darkness even more impenetrable – yes, by then drivers of the 124 were grateful to the thoughtful engineers who installed such good lights in their cars. Good for you if you still drive one. The fan base is huge and continues to grow, which is why it’s still worthwhile for accessory providers to produce high-quality spare parts. You can get a whole headlight new for less than 100 euros; individual diffusers cost only half as much. New. If you now put in new H4 and H3 lamps from Osram, you’ll be able to see further than most other people on the road. And on cold, dark nights even the view of the dashboard leaves nothing to be desired. The instruments are illuminated in a yellowish white, pretty much glare-free and discreet. The analog instruments with the most important information are right in front of you, and the controls for ventilation and heating are on the central console. Depending on the trim there are a couple more buttons, and everything is easily accessible from the firm, comfortable seat. The E-Class joins a fairly short list of high-mileage vehicles, something that is also reflected in used-car statistics. Almost 7% of the used cars offered on the market have more than 300,000 kilometers on the clock. Volvo, BMW and a few surprise candidates also have a few things to say about that, but we’ll shine a light on that some other time. For now the Osram team is looking forward to driving home in the dark and the fog. Because we drive with high-quality lamps, which turn some of the night into day.